Fallen trees and powerlines near Point Lobos State Natural Reserve shutdown Highway 1 south Wednesday morning. Traffic was backed up to Monastery Beach, about a mile away. Tree trunks and piles of branches sit on both sides of Highway 1 near Point Lobos. A hazardous tree on Dolores St in Carmel threatened several businesses, including Ami. John Ley of John Ley's Tree Service helped remove the Monterey Pine. He has a contract with the City of Carmel. Gusty winds brought several trees down throughout Carmel. Resident Mark Governor took this picture on 1st and San Carlos. The National Weather Service has issued a Flash Flood Watch through Thursday morning. CHP says never drive through flooded roaways. An atmospheric river that originated near Hawaii will continue to rain down on the Monterey Bay area through Thursday morning. The storm has caused big problems, including power outages, flooding and downed trees. Fallen trees and powerlines across Highway 1 near Point Lobos stopped traffic Wednesday morning. Cars were backed up to Monastery Beach, about a mile away. Mark Machado pulled over to wait in his white truck. “Very breezy. Trying to dodge the trees and traffic. But still getting some things done,” Machado says. Machado has a business called Aquajito Pools and he had a job in the Highlands. He eventually got through when crews reopened Highway 1 around noon. But piles of tree branches still sit alongside the roadway; you can smell the sap in the air. Gusty winds also brought down trees in downtown Carmel. That’s where Kim Theobald has a homegoods shop called Ami. When she got to work, she noticed the top-heavy Monterey Pine tree in the sidewalk near Ami was swaying. “It's freaky. There is concrete all around it so I thought, oh it's going to hold it down. And then I started to see the concrete actually moving up and down,” Theobald says. If the tree fell, it could have crashed through the roof of her shop or other nearby businesses, including the Carmel Post Office. Luckily, the city hired local tree service companies to help out. Iverson’s Tree Service and John Ley's Tree Service removed the pine before it toppled over. 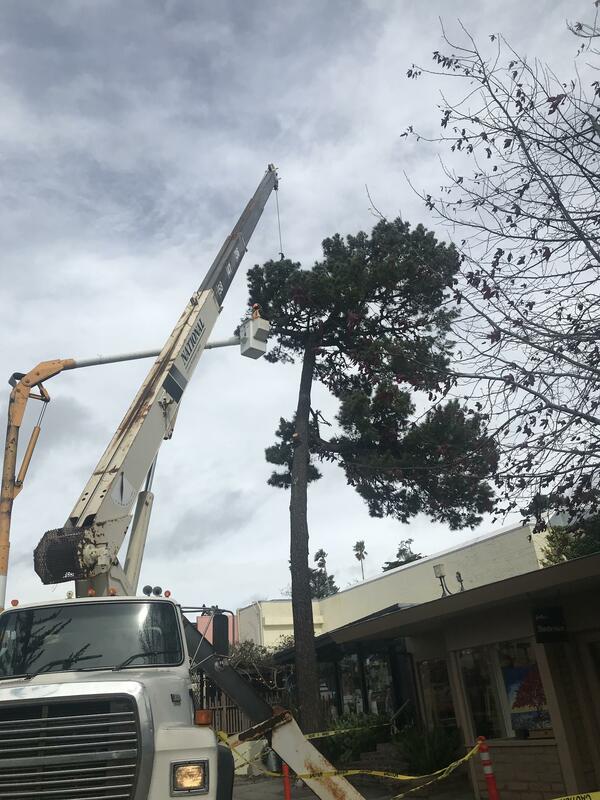 Crews successfully removed the Monterey Pine before it fell and potentially damaged several shops in downtown Carmel. John Ley says with the past few storms, he’s been incredibly busy. “I've had at least half a dozen calls today [Wednesday] that I'm not even going to be able to get to until tomorrow, just to look at them,” says Ley. The atmospheric river also caused flooding throughout the region. The ground is saturated from a few other storms so low-lying areas flooded quickly. The National Weather Service has a Flash Flood Watch in effect through Thursday morning for the entire Monterey Bay area. Areas above 1,000 feet are under a High Wind Warning and valleys are under a Wind Advisory. As of 11:45am Wednesday, about 14,590 PG&E customers are without power on the Central Coast. Following six days of consistent rain, Central Coast residents have been dealing with downed trees, rockslides and power outages. In Carmel Valley, people continue to monitor the Carmel River.